Fujifilm and imec have developed photoresist technology for making organic semiconductor devices using the lithography equipment meant for silicon semiconductor devices. The photoresist what is used in silicon semiconductor, dissolves organic semiconductor material during processing, due to the organic semiconductor material's physical property is different from silicon. The new photoresist technology developed by Fujifilm and imec causes no damage to organic semiconductor. This technology helps to integrate smaller devices on organic semiconductor. The new photoresist technology for organic semiconductors enables the realization of submicron3 patterns. Both the companies have tested the new technology in creating organic semiconductor-based photodetectors and organic LEDs. With this technology single lithographic equipment can be used both for silicon as well as organic semiconductor except for the change in use of photoresist material and related process. This is expected to save cost and manufacturing of organic semiconductor devices. Organic semiconductor devices is also manufactured by using shadow masking and inkjet printing, which are cheaper than lithography -based manufacturing. imec and Fujifilm were able to produce photodetectors composed of fine light receiving elements down to 200μm×200μm size. Generally, patterning of organic semiconductor materials degrades the property of converting light into electricity (photoelectric conversion property), but the OPD developed in this case were patterned without degradation, claims imec. 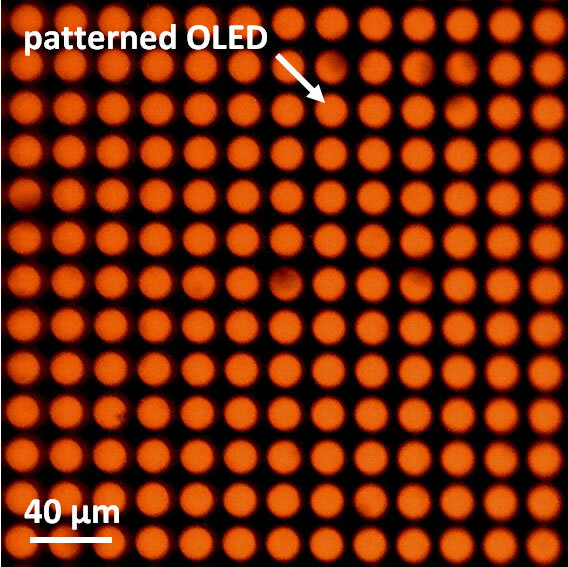 They could also make OLED arrays with 20μm pitch emitting uniform light.